It is estimated that food waste costs UK households £700 per year on average. It is also expensive to dispose of, either via an 'energy from waste' plant or by sending it to landfill. The new service will help residents see - and reduce - the amount of food you waste. And because their food waste will be collected every week, their normal bin will be less full and fresher-smelling. If you have any comments or questions, please email foodwaste@southkesteven.gov.uk or call us on 01476 40 60 80. When does the food waste collection trial start? We will start collecting food waste from the beginning of June. Will my bin collection days change? No - your residual (black bin), recycling (silver bin) and garden waste (green bin) will be collected on the same days as they are now. If you're on the trial, you can present your kerbside food caddy at the same time as you present your black or silver bins each week. Will my neighbours be able to take part in the trial? Not necessarily. We will contact all households in the collection area directly. They can also check their address here. Depending on its success, the Lincolnshire Waste Partnership - which includes Lincolnshire County Council and SKDC - will consider whether to introduce the service permanently. Do other councils offer a food waste collection service? Around half of councils collect food waste, but this is a first for Lincolnshire. What if I don't produce enough waste to take part? I compost my organic waste - is this still a service for me? Yes. 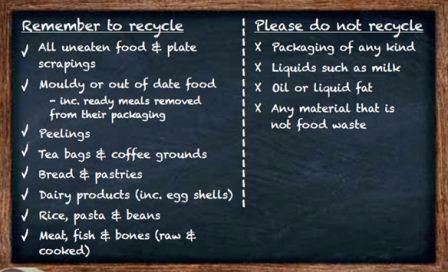 You shouldn't put bread, meat, fish, dairy or any cooked food in your compost. Home composting is great - please keep it up! However, using the food waste caddy means you can recycle all these types of food which shouldn't be composted at home as they could attract vermin. Why can't we put potato peelings in our green Garden Waste bin? It's to do with animal by-product regulations. To properly guard against the risks of foot and mouth disease we can't accept any catering waste in the green Garden Waste bin which may have come into contact with meat products. Happily, they can go straight into your food recycling caddy! In your food caddy every week. Each property in the trial has two food waste caddies, a small 7 litre one and a larger 23 litre one, which is about a tenth the size of a wheelie bin. Residents collect the food waste in the small caddy in the kitchen, and then transfer it to the large caddy for the weekly collection. Can I use a different container in my kitchen? Yes - as long as your food waste is presented in the larger caddy each week. Do I have to use a liner for my caddy? We do recommend using the biodegradable liners we'll supply you with as it keeps the food contained and means you don't have to rinse the caddy after it is emptied. Alternatively, you can line your caddy with newspaper if you prefer. Both caddies can be washed easily. Will you provide a supply of caddy liners? We will provide enough biodegradable liners for the duration of the trial and more will be available from the refuse collection team. Liners are also widely available from supermarkets. Does the food waste smell? It depends what you are collecting, but most households don't find this is a problem - particularly as kitchen caddies are emptied regularly and we collect every week. Will the outside caddy attract animals? What if it is knocked over? You don't need to worry - both caddies' lids have 'locking' mechanisms. What if I don't have room for another bin? The kitchen caddy is small and perfect for the worktop or under the sink. The larger caddy is around a tenth the size of your wheelie bin. But you don't have to keep one in your kitchen - if you only wish to use the larger one outside that's fine. Just use the outside caddy. The kitchen caddy is only 7 litres and is designed to be kept on a kitchen work surface or under the sink. However, if you don't want to use the small kitchen caddy, simply empty your food waste directly into the larger 23 litre food waste caddy, which you can keep outside. · It's better for the environment. Reducing the greenhouse gas emissions associated with landfilling food. A tonne of food that is recycled in an anaerobic digester rather than disposed of to landfill saves 860kg CO2 equivalent. · It's cheaper. Reducing the cost of landfilling waste. · It's used to make energy. Producing renewable energy for the national grid, thus contributing to energy security. · It's used to make fertiliser. Producing liquid fertiliser for local farmers, which helps reduce their reliance on chemical fertilisers. The food is sent to an anaerobic digester where it is broken down naturally by bacteria in an oxygen-starved environment. This produces biogas, which is cleaned and fed into the national gas grid. The liquid residue, called digestate, is used to fertilise local farmland. Any corn starch caddy liners are easily separated from the food waste by a shredding machine before the recycling process begins. Excess energy from the food recycling process is reused on-site. Water used in the process is also recycled and used on-site. You can write your house name or number on the caddy that goes outside. This will reduce the risk of missing bins or confusion after they have been emptied. Yes - if you would like to. Please make sure you arrange between yourselves who looks after it and puts it out for collection. I've been given a caddy but don't want to take part in the trial - can I return it? We very much hope you'll take part in the trial. If you've got concerns or aren't sure about something, please do give us a call; we'd be happy to talk it through with you. Like wheelie bins, the caddies belong to your house. Of course, you don't have to take part in the trial, but we would ask you to keep the caddies in case you change your mind or you move within the trial period. Please don't bin your caddy. Can you put pet food in? Can I put dog biscuits in? What about mouldy food or yeast? Will it affect the process? Mouldy food and yeast will be OK to recycle. It won't affect the digester process because the heat will kill off any mould. I need a replacement caddy. Do I have to use the compostable liner in my caddy? What happens if I put my food waste in my black bin? You will reduce the capacity of the black bin - and we would like you to participate in the food waste trial. If you put your food waste in your black bin it will not be recycled and will be sent either to landfill or to an energy recovery facility. One of the videos says kitchen roll as a liner - can you put that in the outside caddy? Yes you can! We will provide enough liners for the duration of the trial and more will be available from the refuse collection team. Liners are also widely available from supermarkets. We do recommend using a liner as it keeps the food contained and means you don't have to rinse the caddy after it is emptied. Alternatively, you can line your caddy with newspaper if you prefer. Both caddies can be lined with newspaper / kitchen roll or by the use of bags. What do you do if your outside caddy gets full? The larger caddy is collected every week alongside your normal collection. If it fills up, you will need to place your extra food waste in your regular black bin - please call us for advice on your recycling. Who's responsible for keeping them clean? The householder. Both caddies can be washed easily. Most households don't find this is a problem - particularly as kitchen caddies are emptied regularly and we collect the outdoor caddy every week. What about food beyond its use-by-date? As long as it's not on the "Do not recycle" list, old food is fine - but please don't put the packaging in your food recycling caddy. How will we know if it's worthwhile? We will be keeping in touch during the trial - and depending on its success, the Lincolnshire Waste Partnership - which includes Lincolnshire County Council and SKDC - will consider whether to introduce the service permanently. I don't want to do this. Do I have a choice? We very much hope you'll take part in the trial. If you've got concerns or aren't sure about something, please do give us a call on 01476 40 60 80; we'd be happy to talk it through with you. Every week on your normal collection day. If you're on the trial, you can present your kerbside food caddy at the same time as you present your black and grey bins each week. What will happen at the end of the trial? Are the caddy liners biodegradable? They are actually compostable, which means they don't leave any plastic the system when they break down.